It's a bird, it's a plane -- it's my sister! Phil Warden, of San Jose, as he nears the ground with skydiving instructor. Hey, adrenaline junkies: Looking for something fun to do for the weekend? How about taking a stab at skydiving? It'll push you to your limits, take you out of your comfort zone and make you feel quite accomplished. My sister and three friends decided to go recently. They signed up at Skydive Surfcity in Santa Cruz. But a tip to anyone looking to take the plunge --it's important to book early, as the schedule can fill up pretty quickly. The jump was scheduled for 2 p.m., but things can change rather abruptly depending on the weather. On this particular day, foggy conditions pushed the jump back an hour. Despite the change, all the prospective jumpers were totally stoked, nervous and dealing with clammy hands, but most of all excited! I’ll admit I was tempted to jump as well, but hesitated as I have a fear of heights and strongly dislike that stomach-left-hanging-in-the-air feeling you get on roller coasters. Once we were there, a Skydive Surfcity employee tried to console me – maybe even convince me -- with some insight. She said that, in fact, you don't get that same roller coaster sensation because you are not at a standstill then suddenly dropping at a high speed. Since you're in a plane that's already moving, she said, the exit is a smooth transition and you feel like you're floating in slow motion. As for that fear of heights, she said, once you're in the air you don't grasp just how high you really are. That's because you feel like you're floating and moving so slowly that you don't have depth perception, she told me. Even with that info in mind, I decided not to jump this time around. Instead, I drove about 10 minutes from Skydive Surfcity’s office at the Watsonville Municipal Airport to a beach to wait for my sister and friends to land. It was an awesome and amazing experience to watch from the ground as they jumped out of the plane. They were just tiny specks as they leaped from the plane and slowly made their way back to Earth, gently tumbling in the air on the way down. Meanwhile, up in the air, Phil Warden of San Jose described what it was like exiting the plane. "It felt surreal sitting at the door of the airplane with the door open and my legs hanging out behind the landing gear.” Warden said. “Then with a 1, 2, 3 count, we went somersaulting out doing two complete flips before leveling out into the free fall." One by one they slowly descended, landing safely, and totally pumped up from the jump. "It was amazing and not scary at all.” Warden said. “I had complete peace on the way up, out and down. At one point during the dive I remember saying, 'Even here, You (God) are with me. I'm secure in Your hands.' It's just another way to enjoy God's creation. Pretty awesome experience." My sister, Danna, wasn't scared to jump either. "It's a lot of wind on your way down, but it was one of the best experiences of my life and something I've wanted to do for several years," she said. One of the jumpers said he experienced a bit of motion sickness as he got closer to the ground. But they all said the skydiving sensation was exactly as the Skydive Surfcity employee described. In fact, Warden said the free fall was a total rush. "The view was amazing -- looking down at the ocean and coastline.” Warden described. 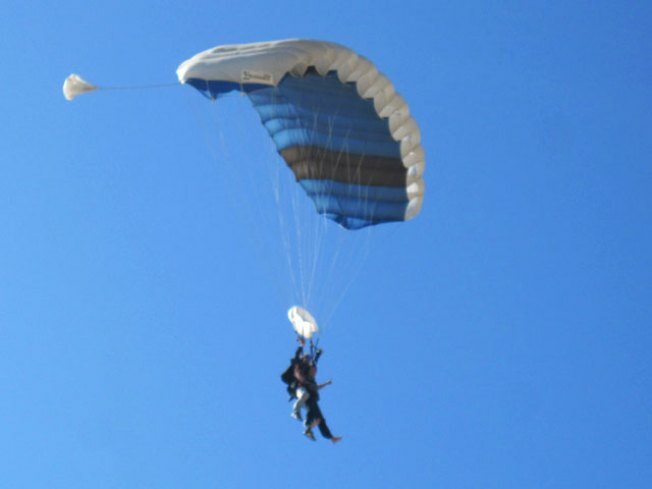 “The feeling of free falling was a liberating experience." Believe it or not, I don't think this will be the end of their skydiving stories. They say they all want to go again! And the next time that happens, I definitely plan on jumping, too -- Well, most likely.